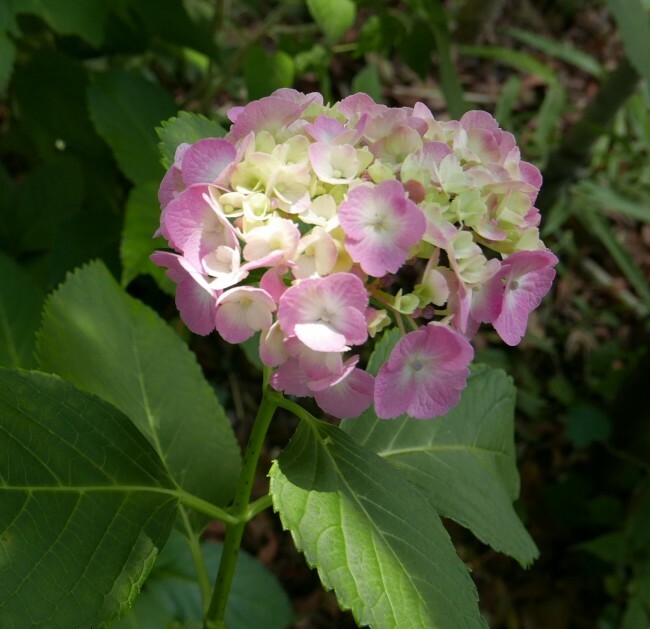 The Japanese rainy season has started and hydrangea are blossoming. This is also true for the Yokohama Campus, though the flowers probably wouldn’t mind if the rainy season did a better job of living up to its reputation. According to the JMA, temperatures across Japan were above average in May, while rainfall was below average (link to the Japanese website). Will the abnormally dry conditions continue? And what is the outlook for summer around the globe? 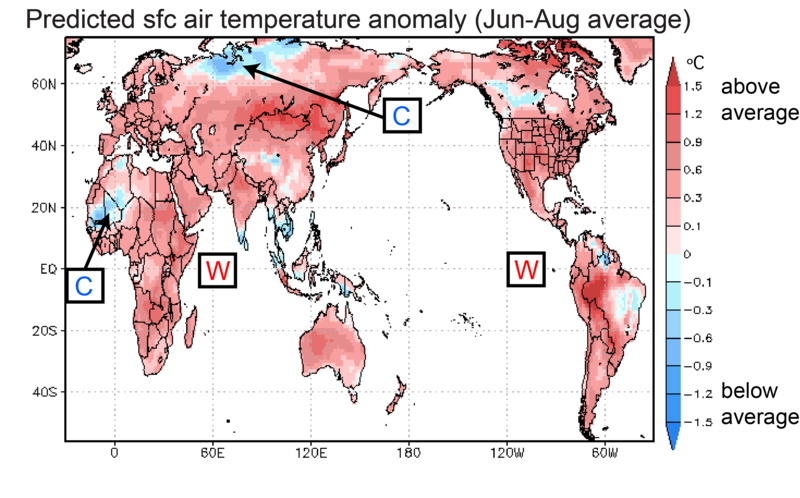 According to the SINTEX-F model, temperatures from June through August will be above average around the globe with a few exceptions, such as Siberia and West Africa. As for rainfall, wetter than normal conditions are predicted for Southeast Asia, Central America and Mexico, and West Africa. Drier than normal conditions are predicted for Indonesia, Australia, India, eastern China, and South America. The tropics may play an important role in these climate patterns. While the chance of an El Niño event has been downgraded, above average temperatures in the entire tropical Pacific are predicted to continue. 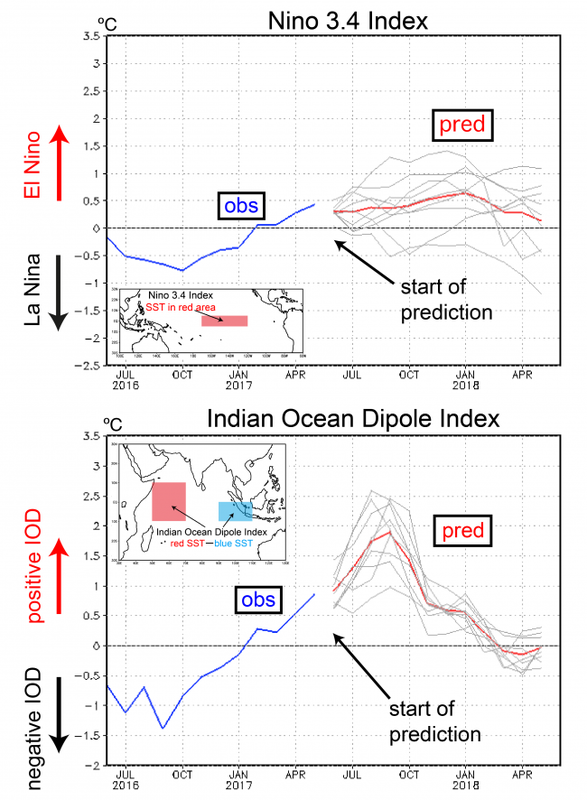 In the tropical Indian Ocean, a pronounced positive Indian Ocean Dipole (IOD) event is predicted to occur, with ocean temperatures warmer than average in the west and cooler than average in the east. The positive IOD event is expected to suppress convective activity over the eastern Indian Ocean and the Maritime Continent. This will increase the chance of droughts in Indonesia and Australia. Figure 1. Predicted surface air temperature anomaly (in °C; average June-August). The prediction was initiated on June 1. As stated above, surface air temperature for the period June through August (Fig. 1) is predicted to be above average in most locations around the world, with cooler than average temperatures predicted in a few locations only, including Siberia and western Africa. Figure 2. Predicted rainfall anomalies (in mm/day; average June-August). The prediction was initiated on June 1. Rainfall for the period June through August is predicted to be above average for Southeast Asia, Central America and Mexico, and West Africa. Drier than normal conditions are predicted for Indonesia, Australia, India, eastern China, and South America. For Japan, the model predicts somewhat warmer and drier than average conditions this summer. This condition is predicted to persist through fall (September through November; not shown). Please bear in mind though that the model’s forecast skill in the mid and high latitudes is rather limited. Figure 3. 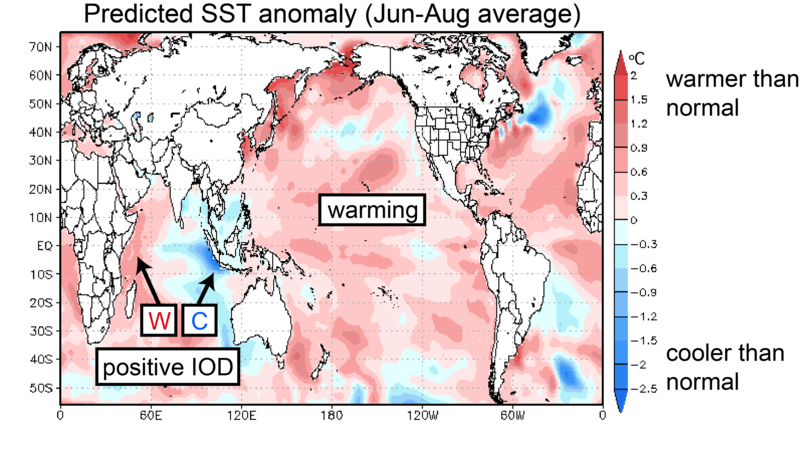 Predicted SST anomalies (in °C) for June-August. The prediction was initiated on June 1. In difference to daily weather fluctuations, seasonal climate variations are strongly influenced by changes in sea-surface temperatures (SSTs). Particularly in the tropics, where the SSTs are warmer than in other regions, even small changes in temperature can produce far reaching effects. According to the SINTEX-F prediction, SSTs in the entire tropical Pacific will be above average during the summer (Fig. 3). Compared to last month’s prediction the chance of an El Niño event developing this year has decreased. One reason for this change in the prediction is that air-sea coupling is relatively weak in early spring. This leads to a large element of uncertainty for predictions initialized around or before this time. The problem is common to all prediction models and has been dubbed the “spring predictability barrier” (see e.g. here for more explanation). We should note that other research centers too have downgraded the possibility of El Niño for this winter. In the Indian Ocean, on the other hand, the model continues to predict the development of a strong positive Indian Ocean Dipole (IOD) event, with cooler than average sea-surface temperatures (SSTs) in the east, and warmer than average SSTs in the west. Positive IOD events typically lead to warmer than average temperatures in western Japan. Particularly this year, with a strong IOD shaping up and the competing influence of El Niño becoming less of a factor, we expect that the remote impacts of the positive IOD will lead to a strengthening of the Ogasawara High (also called Bonin high) and hot temperatures (not shown). So what is the extended outlook for the tropical oceans? Figure 4. Time evolution of the Nino 3.4 (upper panel) and IOD (lower panel) indices (in °C). The blue lines show the observations. The predictions (initiated on June 1) are shown for individual ensemble members with perturbed initial conditions (grey lines) and their average (red lines). Figure 4 shows two SST indices of interest. The Niño 3.4 index is predicted to slightly exceed the +0.5 °C El Niño threshold in November (red line in the upper panel of Fig. 4) and reach its peak shortly after in December. This indicates a weak El Niño occurring in winter. The IOD index is predicted to exceed +1 °C in July, with the peak occurring in late summer/early fall (Fig. 4, lower panel). For Japan, the strong positive IOD tends to favor high pressure systems that, in turn, lead to dry and hot weather. Abnormal weather and climate events are not only influenced by El Niño/La Niña but also by the Indian Ocean Dipole. 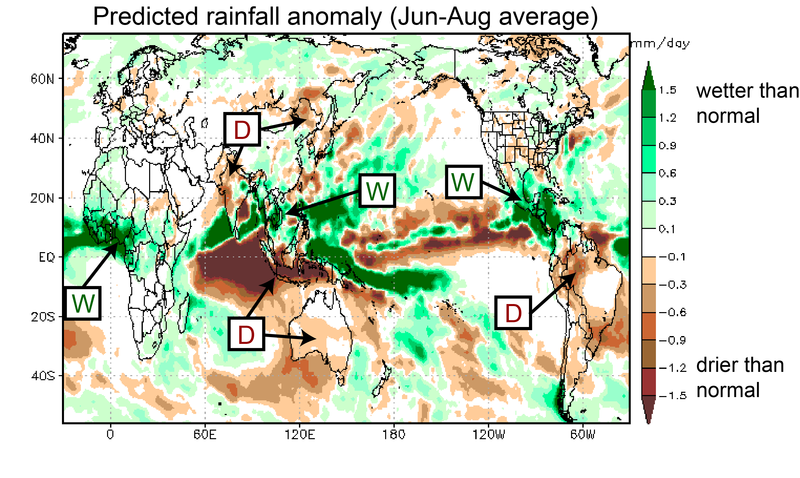 The pronounced positive Indian Ocean Dipole raises the concern for droughts developing in Indonesia and Australia. Further development should be closely monitored.